More than anything else, the first lecture from the course Introduction to Mathematical Thinking focuses on the dichotomy between high school mathematics and college mathematics. High school is how to drive a car; college is how to fix and even build one. High school is pure procedural work; college is about how to think. My first reaction (as a high school math teacher) to this seemingly denigrating view of high school mathematics: defensiveness. My second reaction: the professor is correct. In high school mathematics (and in younger years), it is rare for teachers to break away from the procedural “here-are-the-rules-now-go-apply-them-exactly-as-I-just-showed-you” approach to teaching mathematics. From my experience as a substitute teacher, not many teachers encourage students to think for themselves, ask their own questions, and go about finding ways to answer those questions. But some are. And those folks give me hope, both as an educator and as a citizen-observer of the education system who wants to see kids partake in meaningful learning. So I’m watching and learning from the conversations that are developing about secondary mathematics education. And I’m watching and learning from this course. 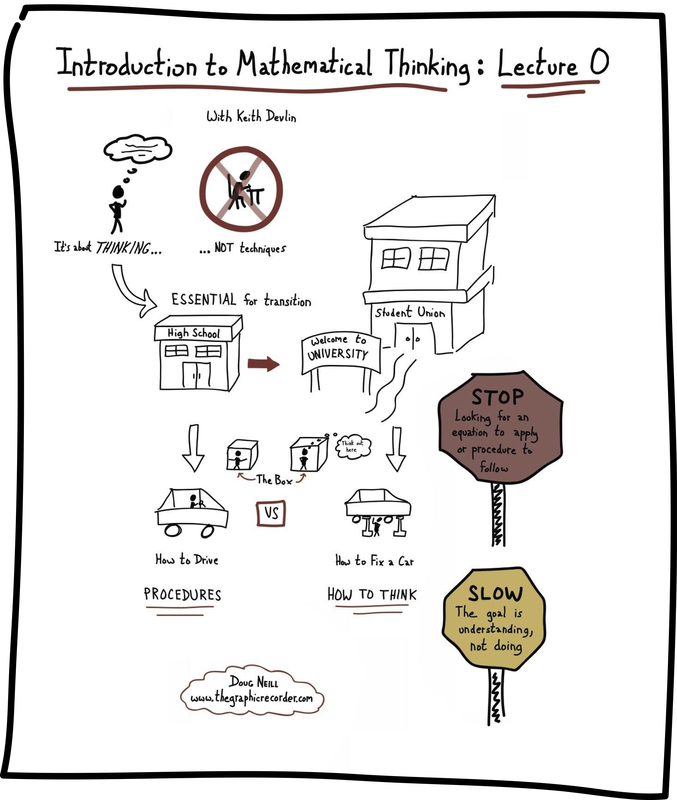 Why should we wait until college to introduce mathematical thinking?